New Study: Downtown Phoenix Generates $9.7B Annually in Total Economic Activity (VIDEO) - Downtown Phoenix Inc.
More and more people across the country are choosing the convenience and connectivity of urban centers, complete with walkable neighborhoods, a diverse mix of fun things to do, access to jobs, and educational opportunities. Phoenix is no exception. Downtown is repopulating at a rapid pace with 7,000 residential units, 13,000 students, nearly 400 tech and creative companies at local co-working spaces, and hundreds of hotel rooms added annually for conventioneers, business and leisure travelers. Combined with major sports, arts and cultural events, the concentration of activity is a boon for the local economy. According to a new report detailing the economic impact of Downtown Phoenix, more than 66,000 people work in the 1.7-mile area, which translates into $3.9 billion in wages. Those numbers combined with direct tax revenues and the total value of goods and services produced within Downtown Phoenix totals $9.7 billion annually — the fiscal equivalent of 28 Super Bowls every single year. “At the end of the day, downtown is punching way above its weight in terms of generating resources for the city, county and state,” said David Krietor, CEO of Downtown Phoenix Inc. 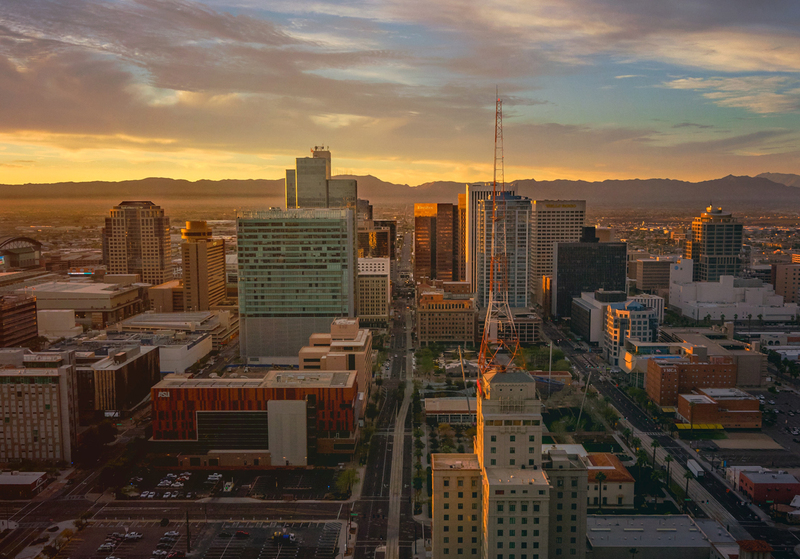 Downtown Phoenix Inc. commissioned the report titled “The Economic Capture of the Downtown Phoenix Redevelopment Area” with the help of Rounds Consulting Group, Inc. The goal was to analyze the downtown redevelopment district — bounded by Seventh Avenue and Seventh Street, McDowell Road to Lincoln Street in the Warehouse District. Concentrated in a land-area less than one-half of 1 percent of the city, downtown’s economic activity generates approximately $167.7 million in direct tax revenues for the City of Phoenix, Maricopa County and the State of Arizona. “Investing in Downtown Phoenix is critically important because the return on that investment helps fund city police, fire, parks and libraries citywide,” said Dan Klocke, executive director of the Downtown Phoenix Partnership. According to the study, there are two main drivers of economic activity in the downtown area. The first is related to ongoing business and residential activity — a surge in housing, retail, restaurant, government and general office activity. The other is related to visitor and tourism spending, which is what downtown is known for — hosting numerous events bringing in millions of visitors every year.